March 13th - Massey Ck planting. March 19th - AGM, Yungaburra. March 20th - Hicks' Planting, Tarzali. March 27th - Carney's Planting, Yungaburra. TREE PLANTING PROGRAM TREAT needs your help! Since inception, TREAT's financial year has been the calendar year. Our AGM, where the accounts are presented to members, was always held in March three months after the end of our financial year. Accounting has become progressively more complicated as more and more Government grants were received - all of which need statements and audits based on the year beginning 1st July and ending on 30th June. To change our financial year meant altering TREAT's Constitution; this entailed holding a Special General Meeting to put the issue to members. On 11 September 1998 the meeting was held at the Nursery; Tony Irvine presided and 34 members attended - more than enough to form a 'quorum' within the rules of our Constitution. The motion to amend our rules to read, " the financial year shall close on 30th June each year" was carried unanimously. During 1999, the Queensland Department of Consumer Affairs (the body which administers the Associations Incorporation Act) require us to hold two AGMs! At the first, held as usual in March, elections will take place and audited accounts for the financial year ending 31 December 1998 will be presented to members. At the second held in September - three months after the end of our new financial year ending 30th June 1999, audited accounts for the six month period 1 January - 30 June 1999 will be presented. The Department says that if members agree, elections do not have to be held at this second AGM. Thereafter, of course, we only need one AGM - in September each year. Light supper will be provided after guest speaker. The following planting's are planned for the coming months. All are encouraged to be involved. Come along and see some of the different sites being planted and put in a brief spell of work with like-minded people. A rewarding experience is assured. Should you require more details phone the relevant contact No. All planting's start at 8:00am on the Saturday - bring a drink, smoko and hat. Keep Saturday 30th January free... for the second in a series of planting's along Peterson Creek. Stage one saw about 3,000 trees planted at Palumbo's Farm on 14th February 1998 with an additional 1,500 on Burchill's and Byrne's properties in March 1998. The aim of this project is to create "Stepping stones" of native vegetation between Lake Eacham National Park and Curtain Fig National Park/Yungaburra State Forest. This year we intend to plant 5,000 trees on de Tournouer's Farm just across the creek from Palumbo's planting. TREAT volunteers and nursery staff have been busily growing local trees for use in stage 2 of the project. Meet at de Tournouer's farm on Peeramon Road near Yungaburra at 8.00 am for a ride to the planting site (see map for directions). Just follow the signs. Bring a hat, sunscreen and a cold drink. A sausage sizzle will be provided at approx. 12.00pm. Since the last newsletter a lot of progress has been made on the Rats in Macs trial. Dr John Wilson, Head of Ecology, Qld University of Technology (QUT), spent a week with Lake Eacham Nursery staff prior to Christmas. John is a rodent specialist with extensive experience in the cane and Macadamia industries, and one of the world's leading authorities on habitat manipulation, a harmless, cost effective method of controlling rodent pests in agricultural crops. Discussions have resulted in QUT agreeing to undertake the crop damage and rodent monitoring components of the project, allowing TREAT and Nursery staff to get on with the job of restoring Type 5b forest, our primary objective on Mazlin Creek. This week, students from QUT commenced damage counts around the plantation to assess the numbers of rat damaged nuts before and after we revegetate the sites, providing a means to demonstrate a cost benefit to growers, and encouraging industry-wide participation in environmentally sustainable agriculture. In addition to monitoring nut damage, students will also undertake a rodent monitoring program. This will involve live trapping and release of rodents over ten nights, twice a year, when nuts are plentiful (January - February) and when no nuts are available (July - August). Our experience in the "Trees for Rat Control" project showed that rats were virtually eliminated from experimental sites within 12 months, and if we can get a similar result in Macadamia, there is every reason to suggest this industry, like sugar cane, will see the economic and environmental benefits and accept revegetation and nature conservation as integral parts of farm management. The involvement of the QUT is not limited to the rat project. It is likely students will also be involved in helping TREAT and the Lake Eacham Regional Nursery with monitoring our revegetation work on Mazlin Creek, bringing an extra dimension to the project and significantly adding value to TREAT's excellent initiative in stimulating interest in restoration of Type 5b forest. Members will be able to see the project first hand and assist with the tree planting's on the 13th, 20th and 27th of February (8.00-11.00 am). Come along and take part in the revegetation of Mazlin Creek and do your bit to rescue 5b, one of the rarest rainforest types in north Queensland. Massey Creek planting site. Turn west onto old Palmerston Highway at Millaa Millaa. Follow the signs. The Massey Creek planting is a component of the Walter Hill Ranges Rehabilitation Project; a Natural Heritage Trust funded project. The Walter Hill Ranges run from Mt. Fisher, between Ravenshoe and Millaa Millaa, down to the coastal lowlands, emerging in the El Arish area. This range remains mostly vegetated and forms a vital link for rainforest flora and fauna between the uplands and the coastal lowlands. In fact, the Walter Hill Ranges is the only remaining vegetation linking upland and lowland rainforest between Cairns and Townsville. The Massey Creek area has been identified as a narrow neck in need of revegetation to strengthen and buffer this linkage. In the 1999 planting season, 12 000 trees will be planted for the Walter Hill Ranges project, 3000 of them at the Massey Creek site. A TREAT planting is scheduled for Saturday, 13th March. Meet at the signposted paddock entrance on Old Palmerston Highway at 8 am to be ferried to the site (see map). A sausage sizzle (or vego burgers) will be provided to finish the morning's work. We hope to see you there. There are many community tree planting groups around the country like TREAT as can be seen by the following information gleaned from "Habitat Australia". A group based in a Brisbane suburb known as Save Our Waterways Now (SOWN) has had as many as 800 volunteers working for the past five years to bring life back to a 26 km stretch of Enoggera Creek - a tributary of the Brisbane River. Participants identify the native riparian plants, collect seeds and propagate and plant them - averaging 35,000 trees annually. Birdlife has increased, frogs have been rediscovered and there are more than a dozen platypus sites along the creek. We have often discussed the possibility of organising the older members of our community - those in retirement homes. SOWN has actually done it - residents from three local retirement homes in the area propagate seeds in readiness for planting by the more agile members of the group. Every age group of every skill level has been included. As a result of this broad-based community training and management of volunteers, SOWN was recently named the Queensland winner of the second annual National Bank Community Link Awards in the Environment, Conservation & Heritage category. There are two species of flying fox that visit the Tolga Scrub, the Spectacleds (Pteropus conspicillatus) and Little Reds (Pteropus scapulatus). In 1990, it was realised that the Spectacleds were dying in large numbers from paralysis tick at various colonies across the Tablelands, including Tolga Scrub. It is still a mystery as to why the tick is climbing high enough and the bat low enough to come into contact with each other. The Spectacleds are throughout the Wet Tropics but it is only on the high altitude Tablelands that the ticks are a problem. Atherton and Lismore are apparently "hotspots" for paralysis ticks but the bats around Lismore have so far not been affected. In response to the tick problem, there are now three bat hospitals on the Tablelands. They are taking responsibility for the colonies at Zillie Falls, Whiting Road and Tolga, as well as the rescue of bats from barbed wire fences and netting. It is estimated that during 1990-95 about 2000 bats each year were being treated by the hospitals. These numbers were roughly halved from 1995-97 and this year Tolga colony was the only one that was really affected. The early wet season around Millaa Millaa seems to have inhibited the ticks in that area. From Tolga, we treated 212 adult bats, and found 77 already dead. These figures do not account for bats that fall when they fly out at night. To put the above figures into perspective, the latest census figures for the three colonies, indicate that there are approximately 2000, 9000 and 4000 bats respectively at each of the monitored colonies. Tick season coincides with baby season, so that we always have orphans in care as well. This year at Tolga, we had 85 orphans, 35 of whom were born with cleft palates. Between March and November 1998, census figures showed a drop of almost 50% in these three colonies on the Atherton Tablelands. Why should we be concerned - Flying foxes are the only mammals with the ability to rapidly disperse seeds from one rainforest tract to another. They will fly 8-22 km in the time it takes for seeds to pass through their guts, albeit seeds less than 5mm. They feed mainly on fruits from Myrtacae (Syzygium) and Moracae families and flowers from Myrtacae (Syzygium and eucalypt). Flying foxes also disperse seeds through their spats - the flying fox does not swallow fibre, it is spat out. Of all the flying foxes the spectacled is the only rainforest specialist. It has an extremely important role in the propagation of rainforest. Save a bat and you're planting lots of trees! 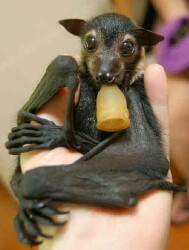 Any TREAT members interested in a tour of the bat hospital are welcome to contact: Tolga Bat Hospital. Terminalia sericocarpa belongs to the family Combretaceae. Combretaceae is a family of about 20 genera and almost 500 species; 5 genera occur naturally in Australia. Terminalia is a genus of about 200 species, pantropic in distribution with 24 species in Australia. A fast growing attractive tree to 30 m, Terminalia sericocarpa is recognised for the important contribution it can make to any rehabilitation planting. Its rapid growth and early fruiting of sweet plump nutritious fruits make it attractive to a range of birds and other wildlife. The fruit are also fit for human consumption and are tasty eaten fresh or made into jams, fruit cordial, wine, etc. Common names include Damson, Damson Plum, Sovereignwood and Bandicoot. The leaves are simple and can be arranged alternately or whorled with small oil dots visible with a lens. Old leaves turn red prior to falling. Damson plum forms a good carpet of litter when it drops its leaves in September or October, reshooting shortly afterwards with a very attractive flush of new growth. Mature fruits are ovoid, 13-18 x 8-10 mm in size with a single seed covered with a green then plum coloured juicy flesh. Terminalia sericocarpa is endemic to Australia, it occurs in WA, NT, CYP and NEQ and southwards to central Queensland. Its altitudinal range is from near sea level to 750 m. Although usually found in well developed rainforest, it can also occur in drier rainforest, monsoon forest and gallery forest. I have recently visited the Platypus Viewing Area near the Peterson Creek bridge at Yungaburra. The platypuses are delightful and the opportunity for visitors to see them is great, but the condition of the creek at that point leaves much to be desired. Several community groups such as TREAT and the Lower Peterson Creek Rehabilitation Group as well as the Queensland Parks and Wildlife Service and the Wet Tropics Tree Planting Scheme have expertise in creek bank improvement. The business people and residents of Yungaburra must be concerned about the beauty of that part of their town. I feel sure that with the cooperation of the land-holder and some of these groups, a great improvement could be made. Creeks lined with native trees shading the water and discouraging grass, etc, could be a feature of our landscape, and it is good that many Tableland creeks are now being revegetated. Yungaburra will make sure that their famous platypuses have beautiful surroundings, I feel sure. Construction of the new car park and production bay has commenced at the Nursery. Hopefully all of the major work will be completed over the next month with minimal disruption to normal operations. However we ask everyone to be patient with the ugliness and we promise the result will be worth it! Last week Marcelo Moriera commenced his 5 month university internship at the Nursery. Marcelo is a fifth year student from the University of Botucatu in Brazil and (in addition to improving his English) is here to learn first hand about techniques for rainforest rehabilitation. I'm sure everyone is aware of the enormous challenges facing the Brazilian people as they try to preserve their remarkable forest diversity and rebuild Amazonian forests devastated over the past three decades. Hopefully Marcelo will be able to take his new skills and knowledge and use them to start Brazil's own version of TREAT! If there are any TREAT members who speak Portuguese (or Spanish) we would love you to visit sometime and say ola to Marcelo. Quarterly mammal, bird and reptile monitoring will be completed at Donaghy's and Peterson Creek Corridors by January 30th, commencing the second year of this work. From amongst the bitten fingers, sore necks and leech bloodied socks interesting data is emerging - more about that in the next newsletter. TREAT has a Web site under development at the moment, you can check it out at: (since moved to current site) www.treat.net.au Any comments or suggestions can be e-mailed to either Jeff Hall or Simon Burchill. The TREAT committee would like to compile a list of e-mail addresses of TREAT members, if you have an e-mail address, e-mail John Hall at TREAT to be included on the list.